Lots of good teams, but no great ones. The opening week of this NFL season featured a record number of close games that provided more than a hint of things to come. Because after Minnesota’s loss on Sunday to Philadelphia, there are no remaining undefeated teams. For reference, this time last year, there were five undefeated teams. Sharon Katz at ESPN Analytics wrote Monday that every NFL team is flawed. Using Expected Points Added1 as her preferred measure of offensive and defensive efficiency, she showed that no team is excelling on both sides of the ball this season. How does that fit into the league’s recent history? ESPN’s EPA data goes back to 2006, and the chart below shows the EPA for each team in each season since then. The top teams would be expected to occupy the far upper-right portion of the upper-right quadrant — those teams would have the most EPA on both offense and defense. But this year, no team is occupying that upper corner. If you take the average of each team’s offensive and defensive EPA as a rough measure of aggregate strength, the highest-ranked team in 2016 is the Eagles at 28.0. However, of the 353 teams from ’06 to ’16 through seven weeks, that ranks as just the 33rd-best score. In other words, over the previous 10 years, there was an average of 3.2 teams per season that fared better than 2016’s top team. On the other hand, there are no truly dreadful teams, either. 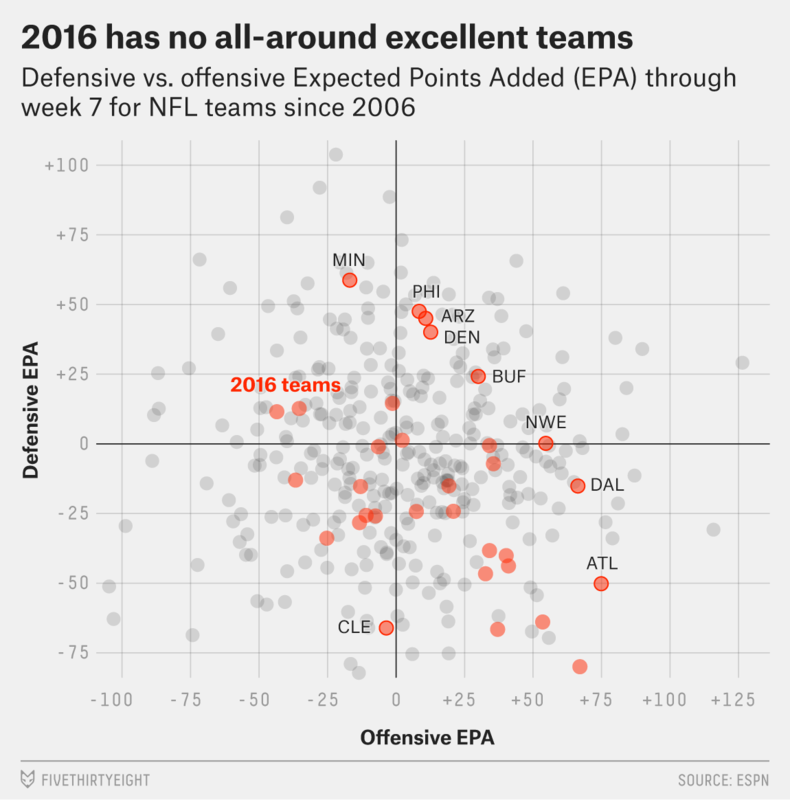 The Browns have the worst average EPA this year (-35.0), among teams that have negative grades on both offense and defense. Over the same span, there was an average of 2.5 teams worse than this season’s worst squad. Minnesota boasts the top defense in the NFL, but an offense that is far below average. The Vikings rank dead last in yards per carry, and prior to this season Sam Bradford had been one of the worst starting quarterbacks in the NFL. And while Bradford had played well this year, he finished with the lowest QBR of any passer in week seven. Given the significant concerns on the offensive line, this figures to be a problem all season for the Vikings. As Katz wrote, EPA accounts for the context of every play and how each play contributes to the unit’s ultimate goal of scoring (on offense) or limiting opponents’ points (on defense). Read more about EPA here.